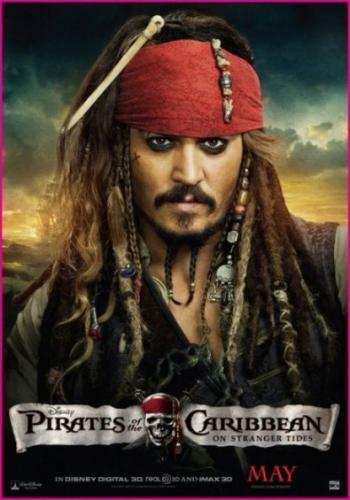 Review - " Pirates of the Caribbean: On Stranger Tides "
ship is headed. Unfortunately so are the British and the Spanish. accomplished before gaining entrance to the fountain...collecting three silver chalices and a tear from a mermaid. No biggie. and his leg, but nothing can keep this guy down. (Astride Berges-Frisbey)...a mermaid who is has a much kinder heart than her sisters. is charming one moment and a cold stone killer the next. Yet when he's on the screen, you can't take your eyes off of him. Geoffrey Rush is also excellent. He actually makes you feel compassion for the vile Barbosa. The special effects are as good as the past. Definitely a must watch, especially if you’ve watched the past three movies. maps and mermaids and ships in bottles. After an edge of your seat sword fight, Angelica knocks Jack out. turns out...Angelica is Blackbeard's daughter. Blackbeard is your basic evil sociopath who wants to live forever.